Eight children die every minute because their diet lacks essential nutrients. They will continue to do so unless food aid changes. MSF admitted 181,600 malnourished children to inpatient or outpatient feeding programs in 2015. When children suffer from acute malnutrition, their immune systems are so impaired that the risk of death is greatly increased. According to the World Health Organization (WHO), malnutrition is the single greatest threat to the world’s public health. The critical age for malnutrition is from six months—when mothers generally start supplementing breast milk—to 24 months. However, children under five, adolescents, pregnant or breastfeeding women, the elderly, and the chronically ill are also vulnerable. People become malnourished if they are unable to take in enough or fully utilize the food they eat, due to illnesses such as diarrhea or other longstanding illnesses, such as measles, HIV, and tuberculosis. From six months onwards, a child must have a balanced diet to lead a healthy life. Malnutrition severely weakens a child’s immune system. Wasting occurs when a malnourished person begins to consume their own body tissue. RUTFs are the most effective way to treat and prevent malnutrition. Breast milk is the only food a child needs for its first six months. Beyond this point, breastfeeding alone is not sufficient. Diets at this stage must provide the right blend of high-quality protein, essential fats and carbohydrates, vitamins, and minerals. In the Sahel, the Horn of Africa, and parts of South Asia, highly nutritious foods such as milk, meats, and fish are severely lacking. This is why a common cold or a bout of diarrhea can kill a malnourished child. Of the seven million deaths of children under five years of age each year, malnutrition contributes to at least one-third. Understandably, the most common sign of malnutrition is weight loss. Loss of weight may also be accompanied by a lack of strength and energy and the inability to undertake routine tasks. Those who are malnourished often develop anemia and therefore exhibit a lack of energy and breathlessness. In children, signs of malnutrition may include an inability to concentrate or increased irritability, and stunted growth. In cases of severe acute malnutrition, swelling of the stomach, face, and legs, and changes in skin pigmentation may also occur. If dietary deficiencies are persistent, children will stop growing and become ‘stunted’—meaning they have a low height for their age. This is diagnosed as chronic malnutrition. If they experience weight loss or ‘wasting’—low weight for one’s height—they are diagnosed as suffering from acute malnutrition. In the severe acute form, children with kwashiorkor—distended stomachs—can be clinically diagnosed with body swelling, irritability, and changes in skin pigmentation. 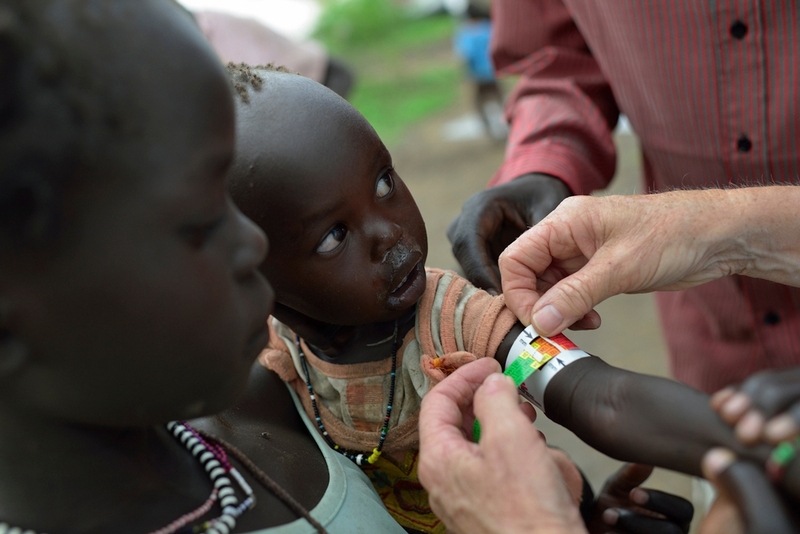 An MSF nurse measures the mid-upper arm circumference of a young patient for indication of malnutrition. He was admitted into the feeding program. Where malnutrition is likely to become severe, Doctors Without Borders/Médecins Sans Frontières (MSF) takes a preventative approach by distributing supplementary RUTF to at-risk children. In 2015, MSF admitted 181,600 malnourished children into feeding programs.